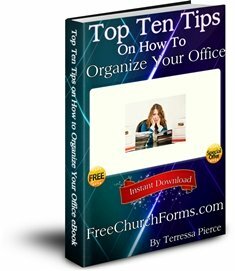 Free office Ebook called "Top Ten Tips on How to Organize Your Office"
The eBook available is full of tips and steps on how you can organize your office and in turn get a lot more work done and relieve stress at the same time. I have been working in various offices through most of my career (over 34+ years), and believe me I have learned through my mistakes the best ways to organize an office. If you would like to receive access to my free 14 page eBook - "Top Ten Tips on How to Organize Your Office" you can do so by simply signing up for my free monthly newsletter (The Form Gallery). This is a Thank You gift for signing up. You will be able to access this eBook immediately from the back issues. Please feel free to contact me if you have any questions or concerns with any of the forms. Return to Home Page from Free Office eBook.